Alec B. O'Connor, M.D., M.P.H. Dr. O'Connor graduated from the University of California at Berkeley with a B.A. in Molecular and Cell Biology, then obtained his M.D. from Indiana University School of Medicine in 1996. 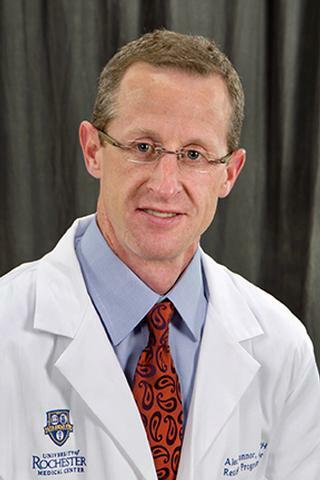 He completed internal medicine residency and a chief residency year at the University of Rochester in 2000. He is Program Director for the Internal Medicine Residency and an Associate Professor of Medicine. Additionally, he is a practicing hospitalist at Strong Memorial Hospital. Dr. O’Connor is active in several ongoing projects, such as studying the effect of the transition from a traditional internal medicine residency infrastructure to a “6+2” Block Model, while delving into Internal Medicine Residency Program Director burnout causes and effects. He is also looking at the integration of Point-of-Care Ultrasound into clinical practice and internal medicine residency training, plus the impact of in-house attending support – namely a Nocturnist - has on residents’ experience on night float. His scholarly interests include resident and student education, improving pain management and the cost-effectiveness of care. Outside of medicine he enjoys running, cycling, skiing and good food. Turk D.; O'Connor AB. ; Dworkin RH. ; Chaudhry A.; Katz NP, et al. "Research design considerations for clinical studies of abuse-deterrent opioid analgesics: IMMPACT recommendations". Pain. 2012; 153: 1997-2008. Lang VJ. ; O'Connor AB. ; Blatt A.; Gracey C. "Collaborative development of teaching scripts: an efficient faculty development approach for a busy clinical teaching unit". Journal of Hospital Medicine. 2012; 7: 644-648. Alexander GC. ; O'Connor AB. ; Stafford RS. "Enhancing prescription drug innovation and value". Annals of Internal Medicine. 2011; 154: 833-837.